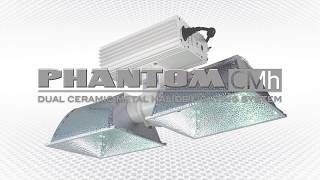 The attached Phantom Dual CMh 315W ballast features low frequency, square-wave technology and is silent, reliable, and energy-efficient. It has two discrete channels and power switches, and a USB port for PX1 controller compatibility. Input voltage options are 120V, 208V, and 240V.